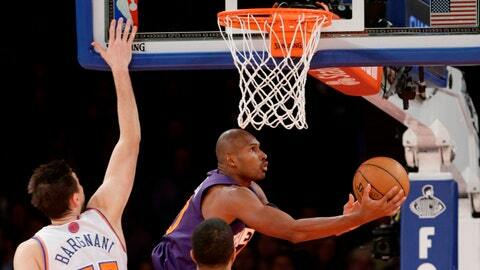 The Suns on Saturday signed guard Leandro Barbosa to a second 10-day contract. Barbosa signed his first 10-day contract with the team on Jan. 8 following the news that point guard Eric Bledsoe would be out indefinitely for knee surgery. The 31-year-old Barbosa has appeared in four games since, averaging 9.3 points, 2.5 rebounds and 2.3 assists in 21.5 minutes. After tallying 21 points in the Suns’ loss to the Knicks in New York on Jan. 13, Barbosa has missed the last two games due to a shoulder injury. The 6-foot-3, 194-pound Barbosa is in his 11th season in the NBA, the first seven of which were played with the Suns, as he averaged 12.6 points, 2.6 assists and 2.4 rebounds in 466 games with Phoenix from 2003-10. Barbosa won the 2006-07 NBA Sixth Man of the Year Award after posting career highs of 18.1 points and 4.0 assists per game.